If she is quite infatuated with him, why is she constantly trolling him? (in the match with Jin and those lolicon comments) jelly maybe? Yaichi has always been a lady killer. Definitely jelly lol, otherwise she would have no reason to troll him. > Machi wins the title match against Ryou and defends her title. > Kansousen implies Ten-chan will be the one to face up against Ginko for the Joou title match. > In regards to Yaichi, Machi admits that she doesn't have any desire to monopolize him like Ai, nor is she a stubborn and dishonest girl like Ginko; she is simply content with being able to stay close to Yaichi and support him. > The author mentions in the afterword that he's getting married with a bookstore staff who is a fan of his works. Last edited by Kiyoe; 2018-03-16 at 08:05. Where did you get the illustration from, is there a site you can download them? Volume 9 is scheduled to be released on August 15, 2018. 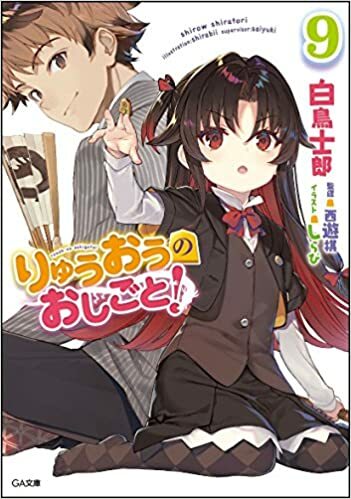 The limited edition will be bundled with fifth drama CD titled "1st Yaichi Kuzuryuu Ryuuou Title Defense Commemorative Tournament". The Bonus Track is titled "Ai-chan's Yandere Level Check". The Drama CD will feature Yaichi, both of his disciples, Ginko, Keika, the JS-ken members, Asuka, and Ika. Last edited by kuudererules; 2018-03-28 at 19:06. Here's an interesting fact. When Ryuuou's author was 17 years old, his wife was 10 years old. Sounds familiar. 7 years is a normal gap amongst married couples... It's not like he fell in love with her when she was 10. That was expected, and since Ginko already got her victory volumes before and considering Ten hasn't got an arc for a while I think its' fair to give her now.